Mike's Musings ... about Ed Tech ... and Other Things: Better late than never? Has education entered the 21st Century? Better late than never? Has education entered the 21st Century? 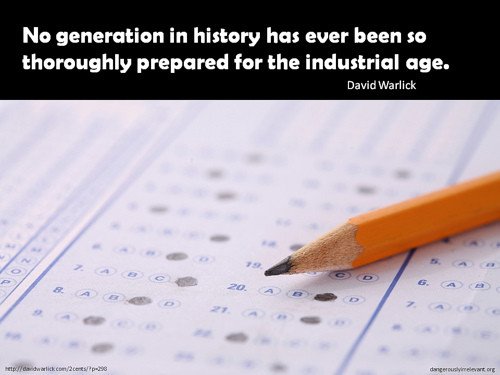 How long will we talk about preparing students for the 21st Century? The 21st century is a decade old. There has been much written about 21st century skills, 21st century learning and 21st century standards but we are coasting into the last few months of 2010. Has education entered the modern age? The unfortunate truth is, however, that for the most part, we have not. We all too often rely on standardized testing and outdated modes of teaching. Thankfully there are growing pockets of change and innovation, yet it seems that clinging to tradition is the norm. We are not just talking about using 'traditional' methods, like lecture or ‘drill and kill’, indeed, a good lecture has value - one just needs to watch some TED talks to see that. Still, this should not be the main method of teaching - we should be using methods of inquiry, problem based learning, critical reflection and collaboration, among others. Digital technology offers many opportunities to change existing pedagogy. It also has some limitations and risks, however, a critical and knowledgeable educator can mitigate those risks by choosing what, how and when to use technology to enhance learning. We must be vigilant in promoting and modeling these strategies. Technology is all around us. Students walk in to our classrooms with laptops and cell phones that offer incredible possibilities. We, as teachers, need to set aside our fears and tap into the opportunities that are inherent in the multitude of devices that are carried in their pockets and knapsacks. It’s time to see past the “no cell phone” policy to a classroom where learning is enhanced through the purposeful engagement of personal technologies and where web resources are available to individual students to access during all parts of our lessons. We must continue to pressure school officials to look forward - to allow the use of the technologies and the Internet and to educate students about their appropriate and ethical use - not hide in the sand and hope it all goes away ... because it is not going to go away.